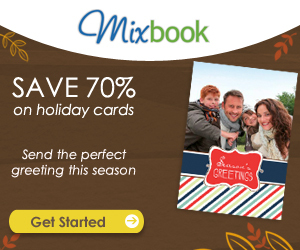 Mixbook Promotion: Nearly 70% off 5x7 Custom Cards For 3 Days Only! “Mixbook is here to get you a deal that was even too much for Groupon to handle! For only 3 days, Mixbook is offering 75 of their 5x7" Flat Classic Coated Cards for $30 with FREE Budget Shipping! That's a savings of nearly 70% off! With the holidays coming fast, think of all the great Holiday Cards and Party Invitations you can send this season. All of which at great savings. Hurry on over to Mixbook and grab this deal before it's too late!" Restrictions: This offer cannot be combined with other coupons, vouchers, Groupons, or applied after an order has been placed. Yes I do accept advertisers. 160x160 Ad space can be purchased by the month or 3 month blocks. Contact me and I can send the price list.